Pack of 12 socket covers and 4 keys. Protection for normalized (French) sockets with or without ground. CommentsYou're renting an apartment or staying by friends in Paris with baby, benefit from our baby equipment rentals service: cot, buggy, high chair... event toys, delivered to your place. 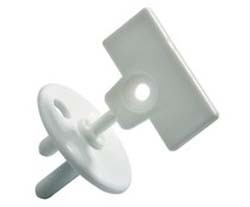 And to make sure baby will be in security, have these socket covers delivered together with your rented baby items.